Thank you for your interest in becoming a part of our wonderful group of artists at Hagan Fine Art. please email us at info@HaganFineArt.com with the following information. 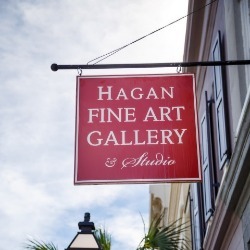 If you find yourself in downtown Charleston, we invite you to pop in the gallery and introduce yourself. However, to give your work the thorough attention it deserves, we ONLY review works submitted through the online method outlined above. Thank you for your interest in being represented by Hagan Fine Art and we sincerely appreciate the opportunity to review your work online.